. . . So now here I sit in one of the many Salt Lake City Starbucks. My boys are down in Salt Lake City attending an afternoon art class. By the way, they LOVE it! Eli is making his very own two-sided ugly doll and Kyle is making a leather snake in honor of one very special baby Copperhead. Because this post has taken months to write, here I really sit at my kitchen island. Both boys are in bed asleep, Dave is at the computer slurping down a bowl of cereal, booking flights to Mexico. Ok, here is where I really sit. I am upstairs in my office. The sun is shining on my laptop and I am laughing out loud because Busy Mom found her debit card and finding her debit card is a call for treats. All I can think about is walking to the kitchen and slicing myself a giant piece of Gluten Free Cake. It is taking every ounce of self-control to remain at the keyboard. For the past year in fits, starts and good intentions, I have been trying to re-launch my blog. 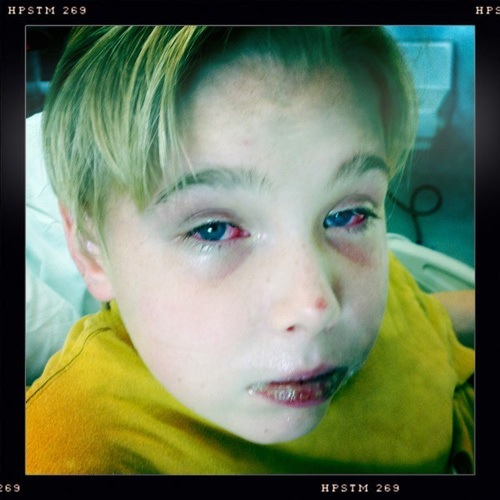 Probably the biggest set back was Kyle’s long battle with Stevens-Johnson Syndrome. I have mentioned that we almost lost Kyle and that Kyle almost lost his eyesight. His eyes still give him trouble and his immune system is still not great. 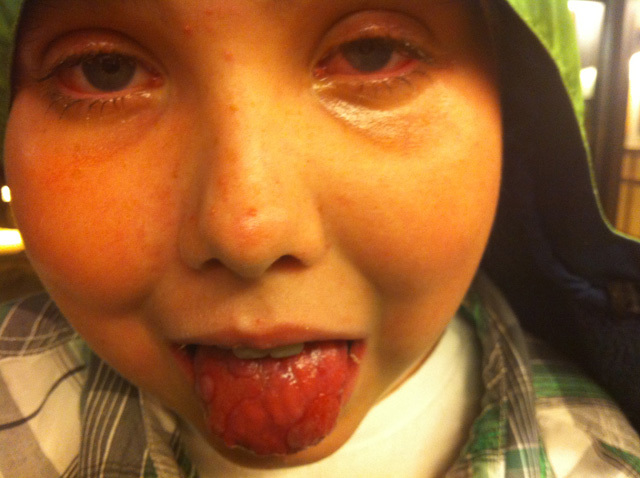 Just last week he had Strep Throat, Hand Foot & Mouth and an ugly Staph Infection on his upper thigh. Our journey is not over. And today, because Kyle was in the hospital exactly one year ago, this is a very tender time for us. In the coming weeks I will share our journey. While Kyle was sick we also learned very quickly that there just is not enough information out there about Stevens Johnson’s Syndrome and its lingering effects. I hope to change that, even a little. In June when we started to accept that Kyle was going to be ok, my body decided to crash. One day I had a sinus infection. Two weeks later I had a miserable case of Pneumonia. I have never been that afraid for my own health. When your breathing is compromised, that is so freaking scary. I decided once again that crazyus.com could wait and that I needed to get myself well. I spent the summer doing just that. Look at it this way. This is my story to tell. So of course, I am grateful. I am for those people who will always hold a big space in my heart, like my lifers like Marianne and Melanie, like my Park City bestie, Beth, and my flip-flop wearing pal, MB. Thank you! I have learned a lot. I am light. I am dark. I am not perfect. I am grateful and happy to be at it again. Thank you Angela. Hey, when is writing group? I love that quote! It’s so so true. Rock on, Beth! glad you are taking care of yourself. sad to hear Kyle is still dealing with lingering SJS. Knew he would be, but still sorry to hear. Those photos still make me cry. Glad life is better for you guys this season. Brenda, thank you for thinking of us. You know how it goes and we are so grateful! I was so worried about Kyle when you posted about his illness… Keeping you in my heart, girl! Thank you Christina. It has been a long, dark & most grateful road. Thank you for keeping me in your heart!